Erosion is a microgame found in the Dance Club Rub stage in WarioWare: Touched! It returns in WarioWare Gold as one of Young Cricket and Master Mantis' microgames. The objective of the game is to rub the top of the mountains to make them flat so that the helicopter can get past through the screen. If the player does not flatten the mountains, the helicopter crashes and the player loses the microgame. This microgame has twice the time to complete. 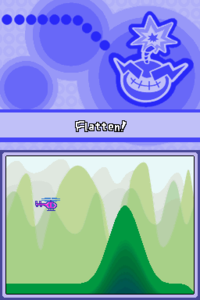 In WarioWare Gold, the player has to flatten the mountains so that a glider can pass through. Also, the timer is half as long as in WarioWare: Touched!, since the glider travels at a faster speed than the helicopter. 1st level difficulty: The player must rub one mountain. 2nd level difficulty: The player must rub two medium mountains. 3rd level difficulty: The player must rub two high mountains. 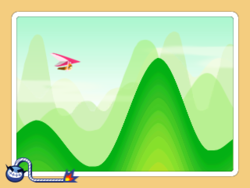 In WarioWare Gold, some mountains are placed above the glider. This page was last edited on April 22, 2019, at 10:18.